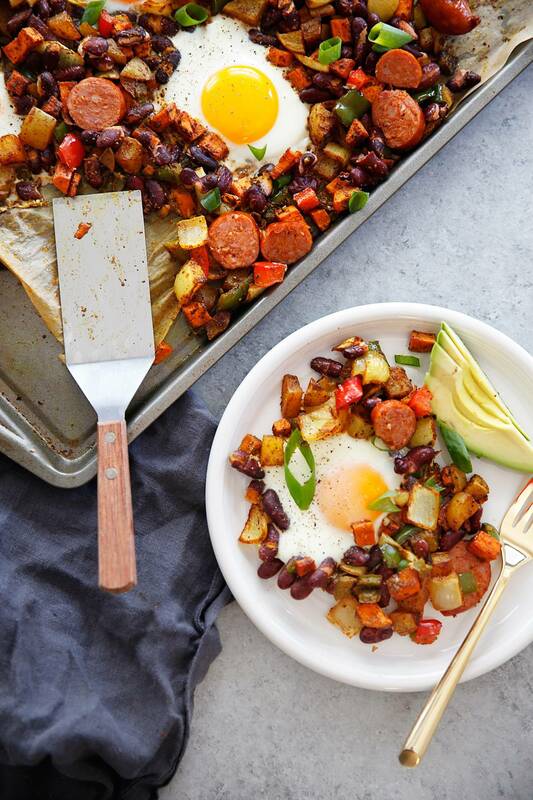 This Sheet Pan Chorizo and Egg Bake is probably my new favorite breakfast. It’s hearty, packed with the perfect amount of spice, and made easy with only one pan. It’s gluten-free and paleo-friendly and the perfect breakfast everyone will enjoy! Sheet pan cooking for breakfast or brunch tends to be overlooked, but it is such an easy way to get a meal on the table at any time of day. We love this one for it’s unique Mexican inspired flavors that makes for a really great brunch. Sheet pans for the win! This hands-off cooking method makes getting a delicious meal on the table simple and the clean up is a breeze. We just love that utilizing the sheet pan allows for unattended cooking, giving us EXTRA time in our busy lives. 1 medium yellow potato, diced to 1/2"
1 small sweet potato, diced to 1/2"
1 onion, diced to 1/2"
In a large bowl combine diced potato, sweet potato, onion, avocado oil, and all spices. Toss to combine and pour onto a rimmed baking sheet. Remove from oven and create four small divots in potatoes to crack the eggs. Crack eggs in the divots and return to oven to bake for 8-10 minutes. Bake until eggs are cooked for desired texture. 8 minutes are soft runny yellow yolks. 10 minutes for more fully baked eggs. If you prefer to slice up the chorizo and bake the slices instead of the whole chorizo you can do that at this step. 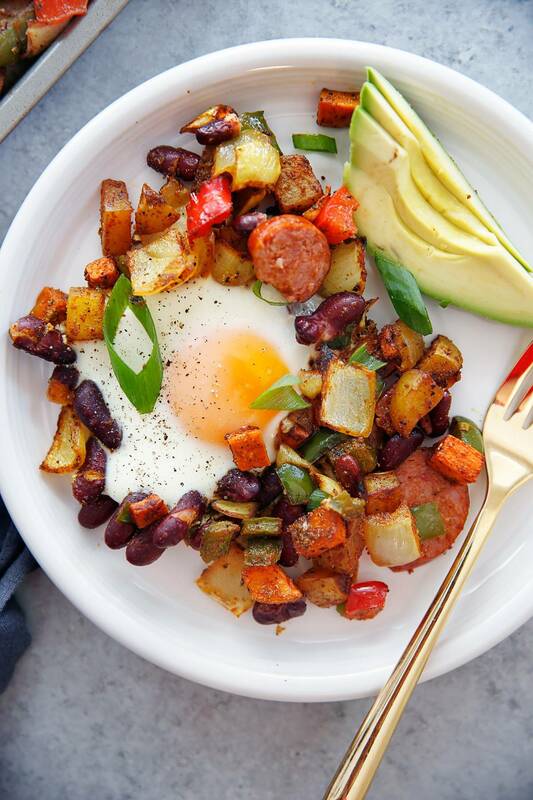 Omit beans for Whole30 and Paleo. 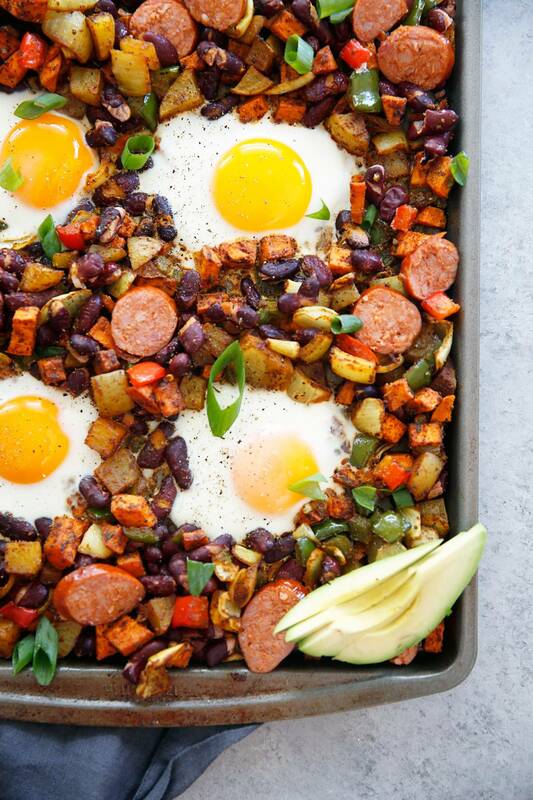 I’ve never tried a sheet-pan recipe for breakfast, but this looks delicious! Give me anything with an egg and i’m sold! I have chorizo that I need to use up but it is not fully cooked. Can I slice it and let it cook with everything else or should I cook it before?